Cat lovers, rejoice: a new study has found that cats are living longer, healthier lives. In this month’s Journal of Feline Medicine and Surgery, researchers broke down what it looks like to be an aging cat in this day and age. They found that improvements in diets and healthcare have extended the life expectancy of the humble housecat. Today, pet cats are living until their late teens or early 20s (the human equivalent of 100 years old). In fact, more than 20 percent of the cats we see around today were 11 years or older in 2011, researchers estimate. But while it’s clear to see that cats are living longer, it’s more challenging to define what it looks like to be an over-the-hill cat in today’s society. While cats may be outdoing their ancestors in the age department, not much is known about what healthy aging looks like. In an 18-page review of existing research on aging in cats, researchers attempted to categorize traits of normal aging versus signs of disease. "An appreciation of normal aging in cats is critical from both a clinical and research perspective. In this regard, it is imperative to be able to distinguish between what would be considered 'normal for age' [versus] unhealthy aging changes," the team wrote. Some signs of normal aging include reduced grooming behavior, a slightly thinned coat, some weight loss. Physical symptoms that don’t affect the cat’s quality of life are generally considered normal. On the other hand, signs of musculoskeletal problems could include trouble jumping or moving, while respiratory problems may be marked by wheezing or trouble breathing normally. 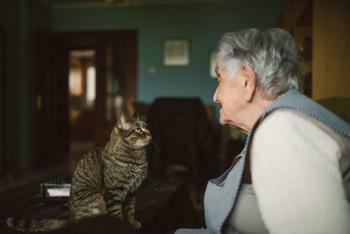 While the paper was intended to be an informative guide for veterinarians, researchers acknowledge the fact that there is more to be learned about aging cats. "Although we provide a thorough review of the current knowledge, it is clear that there is a great need for better understanding in this area." The full review, “Evaulating Aging in Cats,” can be read here.